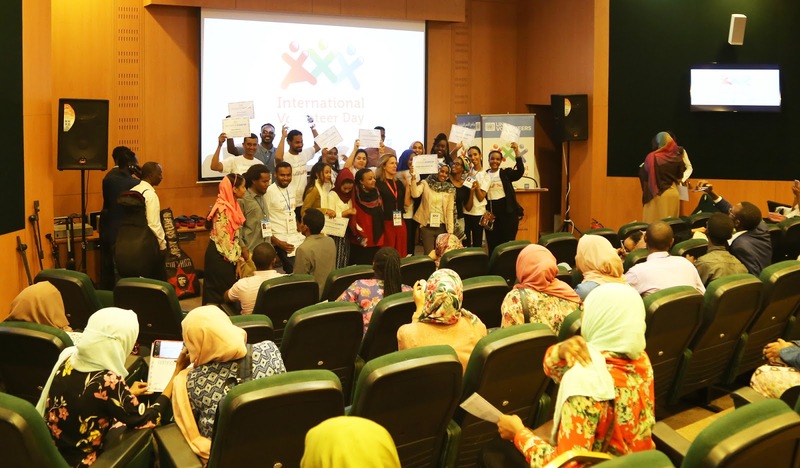 (IYF -Sudan): On 5 December 2018, the International Youth Federation in Sudan celebrated the International Volunteers Day (IVD) in collaboration with the United Nations Volunteers (UNV) in Sudan. The celebration included a youth panel to highlight the existing voluntarism movements in Sudan, shown its values and how it helps local communities, in addition to the challenges and proposed solutions. One of the event’s highlight is the launch of the 2018 State of the World’s Volunteerism Report, presented by Ms. Sophie Lesselin- UNV Regional Portfolio Manager, Arab States. The report draws - for the first time - on field research carried out by volunteers with 1,200 participants in 15 diverse communities. The report also explores how governments and other development actors can partner with locally owned solutions to strengthen community resilience. “We believe passionately in the powerful and positive impacts of volunteering, and volunteerism should be inclusive and open to all, I was inspired by the number of volunteers and the active voluntarism movements we have here in Sudan and the substantive impact of their work on local communities in different sectors.” Said Dr. Rowan Faisal, IYF Representative in Sudan. This year, the celebration focuses on the values of volunteerism through the appreciation of local volunteers, including the marginalized groups and women, who make up nearly 60% of volunteers worldwide, and their impact on building ‘Resilient communities’. Moreover, IVD celebrates volunteer’s efforts that strengthen local ownership and the resilience of the community in the face of natural disasters, economic stresses, and political shocks. The event on 5 December 2018 was focusing on how volunteers can build resilient communities. Apart from mobilizing thousands of volunteers every year, the United Nations Volunteers (UNV) programme contributes to peace and development by advocating for the recognition of volunteers and working with partners to integrate volunteerism into development programming. Link to the full 2018 State of the World’s Volunteerism Report here.